“Auf Wiedersehen, BAOR” – the very last British Military Train. 70 years of the Berlin Airlift with operational Dakotas and German Armed Forces display at Fasberg. The British Army will be pulling out of Germany in 2019, a year earlier than had been originally planned, so although this is not an Enthusiast Holidays tour, we are pleased to support it because (a) like our “Tour of Remembrance” q.v. 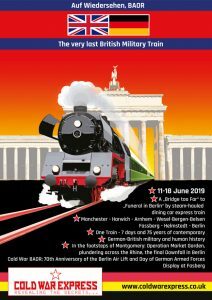 it commemorates things that happened as a direct result of the Second World War; and (b) although it is not a “railway enthusiasts'” tour in the strictest sense, the organisers have – quite properly, in our opinion! – decided that steam should be the main motive power. The recently constructed “A1” 4-6-2 60163 “Tornado” is to operate the Manchester – Harwich “North Country Continental” leg of the journey; following the traditional crossing of the North Sea by Stena Line, the journey within the Netherlands – although sadly not quite from Hoek van Holland, whence the former international railway route to Rotterdam is now a modest tramway (Metro). This short section regrettably will have to be by bus. Onward, however, in Holland, our motive power should be either an “01” Pacific (01.1075) or a “23” 2-6-2 (23.023); and the journey from Bergen to Berlin is to be hauled by a “95” 2-10-2T from Blankenberg. For the return troop train on June 18th a German “V200” diesel – itself now quite an historic beast – has been “pencilled in”. Note, in particular (p.7 of the brochure) that no deposit is required until June 2018 – registration only against a valid credit or debit card guarantees your place(s). In June, assuming that arrangements are sufficiently complete, a 10% deposit non-refundable deposit will be collected, with the balance becoming due in February 2019. All charges are expressed in Euros, which will be converted at the prevailing rate of exchange at the time of payment. This historic journey is one-way – the tour prospectus mentions various options for the return to the UK from Berlin, by air or rail, all of which can be booked with us, or you can of course make your arrangements independently.